Dimensions 60.0 In. X 40.0 In. X 0.29 In. This rug is awful, very cheaply made, super thin and just not a good purchase. This makes me very sad because I love the colors in it. I ordered this in 4 different sizes and gave away the 3 I opened and the biggest one is still in my garage wrapped in the plastic. This carpet exceeded my expectations. I struggled to find the right carpet to brighten up a dark living room and this was the right choice it has been easy to find accent pieces to go along with the carpet! It has transformed my home. I have since purchased the runners, entryway carpets, formal and eat in dining rounds. Nice and flat, doesn’t get caught on the door. Colors are true to picture. Will trim to fit shower room. 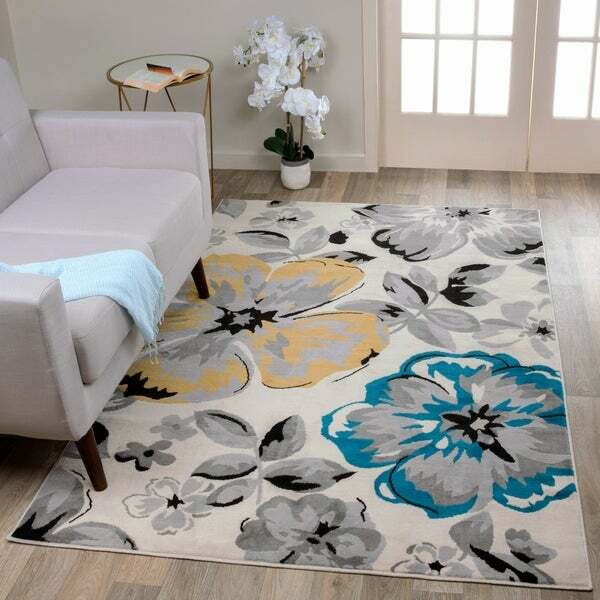 Contemporary Modern Large Floral Flowers Area Rug Cream - 7'6" x 9'5"